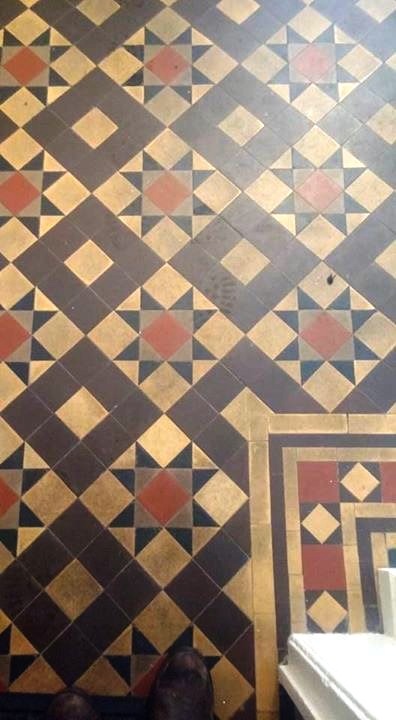 I was approached by the owner of a listed Georgian Townhouse right in the middle of the small market town of South Moulton in North Devon who was struggling to have any impact on the appearance of his Victorian tiled reception area, despite hours of back-breaking scrubbing and had become disheartened by it. Upon arrival a survey on the floor was conducted where I tested the moisture level of the tiles because floors of this age and construction didn’t have a Damp Proof Course and as such were just tiled onto whatever subsurface was already there, which quite often contained rubble and other guiding materials such as lime from the construction of neighbouring properties! Whilst talking to the customer he mentioned that he had some old quarry tiles in his kitchen that he also wanted cleaning, however I’ll cover that in another post. To continue I produced a quote for the work which was accepted and a date was agreed for me to return with all the equipment and products required. 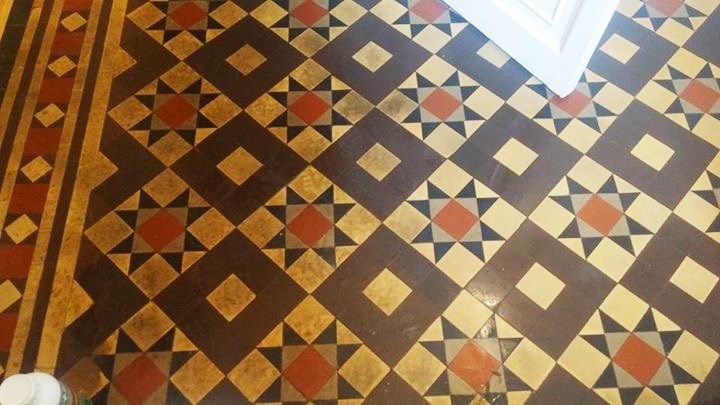 To clean the Victorian tiles in the reception area I applied a medium dilution of Tile Doctor Pro-Clean and left it to soak in for ten minutes. I then set about scrubbing the solution into the tiles using a series of Diamond impregnated burnishing pads ranging from 100-400 grit. Once the whole floor had been treated in this manner it was thoroughly rinsed with water using a wet and dry vacuum to extract the now soiled cleaning solution and I was able to see that the process had really brought the tiles up a treat. Concerned about the damp readings I had experienced earlier I decided it would be prudent to give the floor an Acid Rinse with Grout Clean-up to counteract any potential salt issues (efflorescence) that can be a real problem on these old floors which have no Damp Proof Course. I highly recommend this step on old floors as salts can over time permeate through the tiles and the cleaning process draws them to the surface. Left unaddressed the salts can damage the sealer and leave the floor looking far from its best. Once the tiles had been cleaned, I rinsed the entire floor thoroughly using fresh water to remove any trace of cleaning products, before leaving it to dry off completely overnight. 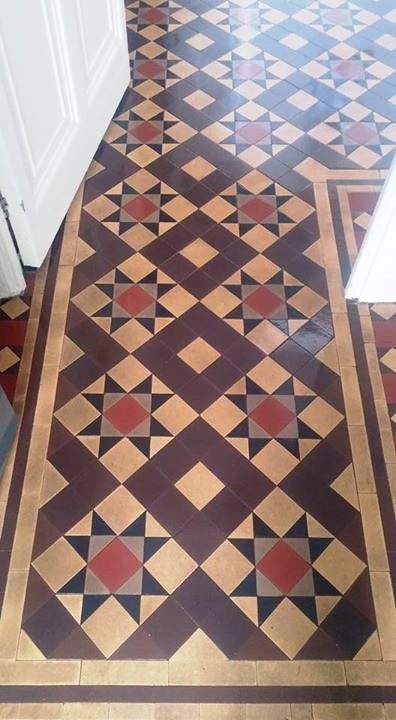 The following day I returned and after rechecking the moisture levels to ensure that they had adequately dried out I started to seal the Victorian tiles in the reception area. To improve colour, I first applied a coat of Tile Doctor’s Colour Grow, a solvent based impregnating sealer which picks out and enhances the natural colour of the tiles, not only bringing the whole floor to life but helping to disguise any damage the floor has suffered over the years. After this coat had dried sufficiency four coats of Seal and Go were applied to finish off the floor and give it that ‘wow factor’. For aftercare I left the customer with some guidance on care and maintenance of the floor as well as a suitable bottle of tile cleaner. 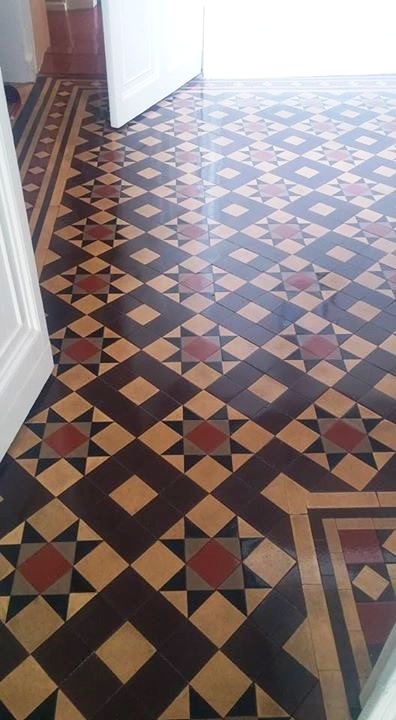 This entry was posted in Victorian Posts and tagged efflorescence, Georgian Townhouse, hallway, Listed Building, North Devon, south molton, Tile Burnishing, victorian tile, victorian tile cleaning, Victorian Tile Sealing by AbzDominise. Bookmark the permalink. Covering Devon and the surrounding area Stuart Tomlin is an agent of Tile Doctor, the largest Tile and Stone cleaning network in the UK who have developed the products and techniques to handle a multitude of issues surrounding tile restoration including stone and grout internal or external.